It removes the user’s dependency on a surface. The motion sensing device can integrate in to the user’s garments/jewelry and be activated based on the users need. It removes the dependency on the large number of keys. 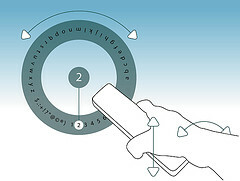 This allows a design of a small controlling device compared to normal keyboards. The use of gross motor interactions can be useful for specific user segments/service types (i.e. disabled users, limiting environments, etc. ).